Macedonia enters 2019 with growing debt, opposition asks where is the money going to? 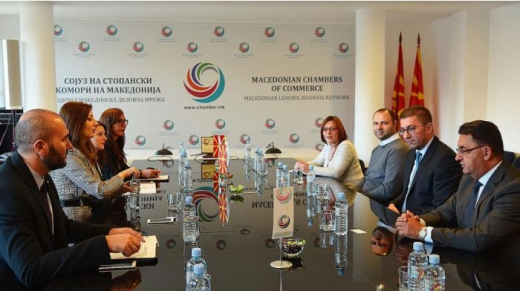 VMRO-DPMNE leader Hristijan Mickoski and top party officials Vlado Misajlovski and Trajko Slaveski met with the Macedonian Chambers of Commerce, one of the two main business associations in the country, to discuss the economic program which VMRO-DPMNE is promoting. – This meeting is the start of a more intensive cooperation. We are here to accept all advice and criticism coming from the participants in the real economy. We’ve all witnessed the disastrous impact of the economic policy pushed by SDSM and their so-called economic team with their many proposals which have completely crashed during implementation. We need to learn from the mistakes, correct hat is wrong and improve on what is right, Mickoski said following the meeting. VMRO-DPMNE was especially critical of the tax hikes introduced by the Zaev Government and his Finance Minister Dragan Tevdovski. Mickoski said that the hikes will be reversed on the first day when VMRO-DPMNE reassumes office.